Campamento Widjiwagan... what could that be? So why, then, are World Cup images and products posted everywhere you look around here? Simple: because although we don't know tons about the Cup, we love everything about the World! 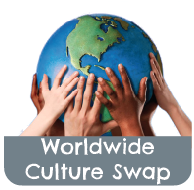 International sporting events, world holidays, and major events of any sort all provide us with such fun and exciting (or sometimes even sad, but meaningful) opportunities to learn more about the world, and teach our children the same. And that is why we are embracing World Cup Mania in our household these days! We began our "learn about the world through the World Cup" journey with a countdown to the World Cup, which is available as a facebook fan FREEBIE here, for just a short time longer. This countdown features all the flags of the nations competing in the 2014 cup, a new one each day. 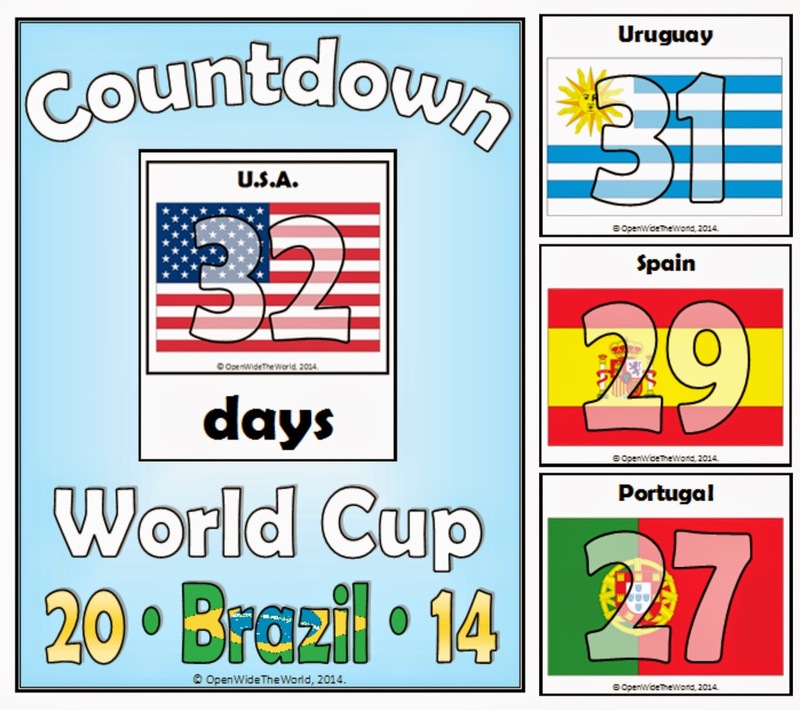 Now that we're well on our way to knowing all 32 countries competing in this Cup (we're heading into Countdown Day 19), it's time to dive a little deeper into the World Cup frenzy, and have some fun with this great new activity pack from Multicultural Kid Blogs. 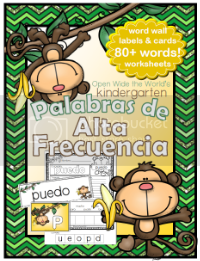 I was thrilled to team up with several other bloggers from the Multicultural Kid Blogs network to create this exciting packet! Such fun working with Alex & Valerie of Glittering Muffins, Monica of Mommy Maestra, not to mention our fearless leader, Leanna at All Done Monkey. Check out this preview of a few of the activities included in this packet, which is created for kids from preschool through 4th grade... but the whole family will enjoy! 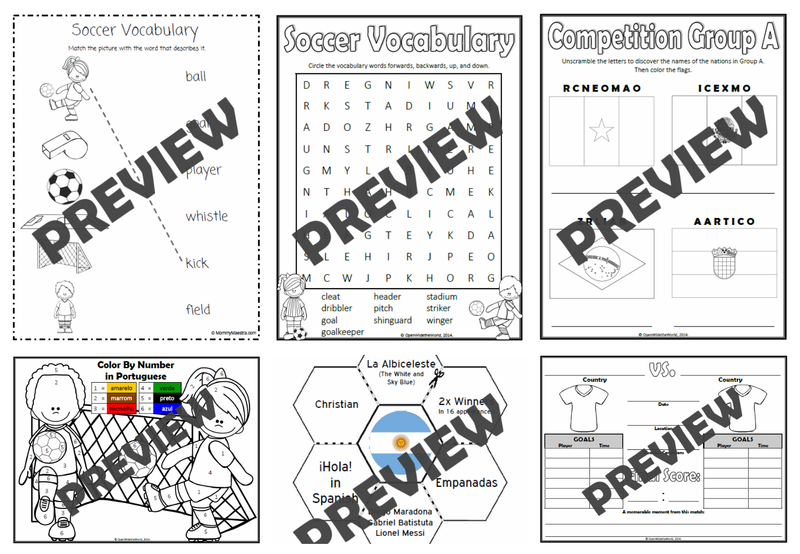 Vocab matching, design your own jersey, size sorting soccer cut & paste, word searches, nation name scrambles, flag matching, a score book, and the quirkiest hexagon-shaped nations' trivia books you've ever seen... these are some of the many activities that will entertain your family for the whole month of World Cup 2014 Brazil (a.k.a. June 12 through July 13). Aproveite a Copa do Mundo! *Wondering why this product is called "World Soccer Cup" and not just "World Cup"? No, it's not because we know so little about soccer that we named it wrong... FIFA actually has the words "World Cup" trademarked; no one else can legally use them together in any marketplace of any sort. Countdown to World Cup 2014 Brazil! In our house, I have to admit, there are no diehard fútbol fans... but there are 3 diehard fans of travel, geography, and languages, and 2 who love sport. Combine those elements, and you've got the World Cup! For each day of the countdown, post the flag of one of the competing nations, and learn all the countries by the opening game. Please note that the countdown officially began on Sunday, so Monday starters should post Uruguay, #31. For more World Cup info and trivia, Mommy Maestra has a great post up today. Check it out here! Some fun ideas for World Cup face painting, a lively music video or two, and other World Cup related pins are filling up my new "World Cup - Copa Mundial" pinterest board, too. 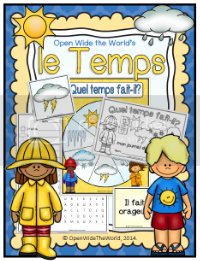 And watch later in the week for a fun activity pack coming from Multicultural Kid Blogs! As I mentioned last year at this time, despite having an ever-increasing number of Japanese relatives, we've only just begun incorporating Kodomo no Hi into our cultural observations. In times past, a family with no sons, like our family, would not have observed Kodomo no Hi; it was traditionally a celebration of sons and male children. Girls had, and still do have, a separate holiday, Hina matsuri, in March. 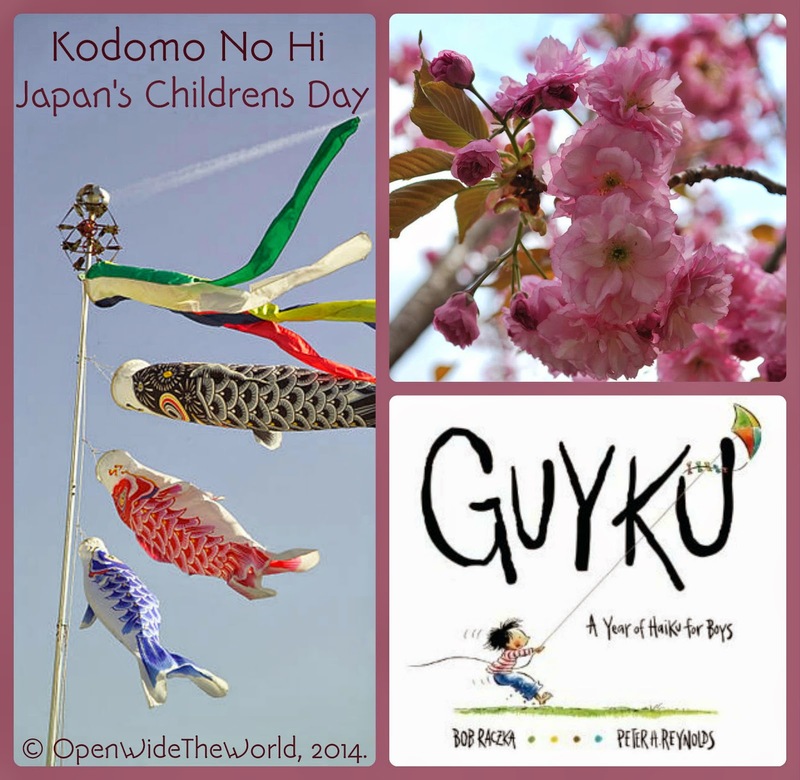 Now, however, Kodomo no Hi has become more of a "Childrens Day," with less emphasis on gender. You can read more about the history and tradition of Kodomo no Hi in last year's post, or in this fascinating post by Melibelle in Tokyo. Since we made koinobori last year, as well as learning the colors in Japanese (check out my multilingual FREEBIE), we wanted to do something new this year. Two things came to mind right away. 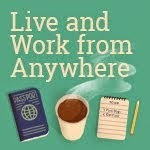 (Actually, three things came to mind, but I'll get to the third at the end of today's post.) One: we love books, and Two: we love the outdoors. So if you're focusing on Japan, and thinking literature and nature, what else can you do but... HAIKU! How can you "do Haiku" with a 6-year old? We began with the library, where we found a new favorite book, Guyku, by Bob Raczka. It's actually called Guyku: a Year of Haiku for Boys, but it truly wold appeal to all kids, and to the parents who read to them. Before reading, we talked about the 5-7-5 syllable structure of Haiku, which is definitely something a kindergartener relates to! And we talked about how a Haiku captures one single moment of time in nature. And from there, we read the book, counted some syllables, and tried to make up some funny lines of our own for the silly illustrations. Super fun! Branches are waving to me. I was impressed by the poem, and even more-so by the enthusiasm of participation. I see more Haiku in our future! Would your kids enjoy having a go at Haiku, too? 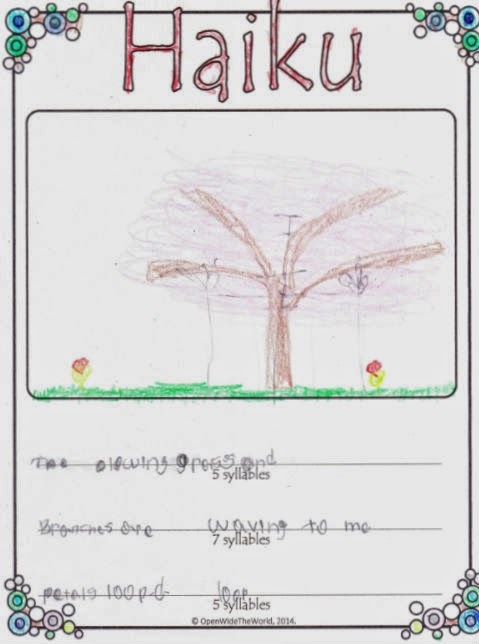 Download our FREE Haiku drawing & composing page here. And thus concludes our first foray into Haiku. But now, remember that 3rd thing that I said came to mind when we were thinking of observing Kodomo no Hi? I bet you guessed it: food! Watch later this week for our on-going Japan adventure and a great FOOD-related FREEBIE!